A familiar sight for collectors at this point, 2016 Leaf Best of Hockey continues the tradition of the buyback product with one premium repurchased card per box. 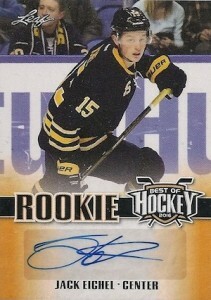 There is also a special card for rookie phenom Jack Eichel that is included in each box. Centering on top autographs, memorabilia cards and key rookies, the release looks back to the recent past and early days of the hockey hobby with a variety of notable cards. Redemptions are a possibility but these are the good kind. Select boxes will replace the buyback with a redemption for a high-end sealed box, including brands like National Treasures and The Cup. While the actual buybacks are all previously issued cards or boxes, there is also an exclusive Leaf card for Jack Eichel, a top 2015-16 NHL rookie with the Buffalo Sabres. In addition to the base cards, limited autographed versions for Eichel average at least one per case. 2015-16 Leaf Best of Hockey Rookie Autograph Jack Eichel SP Auto RC!! Rare!